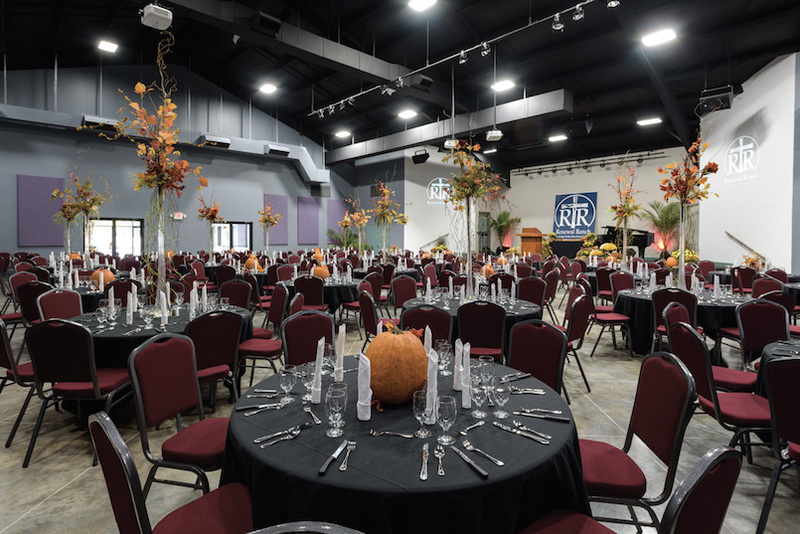 Groups or businesses looking for a venue to host a party or meeting now have a new option – the Restoration Center at Renewal Ranch. Located in Perry County, about 15 minutes from Conway, Renewal Ranch is a faith-based addiction recovery program for men. According to James Loy, executive director of the Ranch, the Restoration Center was designed to meet four major needs on campus. Previously, the ministry had to host Saturday chapel services off-site. He said the new chapel in the center accommodates 200 to 300 who attend the 10 a.m. service on Saturdays, which also is a time for family visits and men can apply for the program. The center also features a commercial kitchen that is used for daily and special event dining. “We had been feeding 36 men on a four-burner stove for the last several years,” he said. The kitchen, designed with the help of noted chef Don Bingham and restaurant owner David Stobaugh, can also be used to cater events at the center. Tables, chairs and dinnerware have also been purchased. The 4,560-square-foot chapel area at the Renewal Ranch Restoration Center is multi-purpose and can accommodate around 300 for a sit-down meal and about 500 with just chairs in the space. “It’s exciting that the public can utilize this facility,” James said, noting the scenic beauty of the 102-acre property. Eventually, the center will also house some offices for the ministry. Bryce McGhee, marketing and development coordinator at the Ranch, has a background in hospitality and will be overseeing outside events at the Restoration Center. The facility has already been the site for several special events hosted by the Ranch and two wedding receptions. In addition, the center has been booked for a small Christmas party and a women’s conference in March. According to Bryce, the space is ideal for small gatherings as well as larger events. Catering will be provided by the trained staff at the Ranch or Jill McCollum Catering. In addition, the Ranch can handle other arrangements for events, including decorations. The men at the Ranch are available to serve the food and are also involved in the setup and tearing down. “We can do it all,” said Bryce. The 4,560-square-foot chapel area is multi-purpose and can accommodate around 300 for a sit-down meal and about 500 with just chairs in the space. There is audio-visual equipment and three screens for presentations. Events in the chapel can also be livestreamed to the entrance area and neighboring classroom. Bryce pointed out that at other venues, a sound system typically has to be brought in. The chapel also has a baby grand piano, a recent gift from Pleasant Grove Baptist Church in Conway. James said the chapel area is bigger than most church fellowship halls and may meet a need in the community. Bryce added that he would like to see other non-profits host events at the Ranch, providing an opportunity for collaboration, and businesses will utilize the space for meetings or one-day conferences. A smaller space off the chapel can accommodate groups of 50 to 80, with access to the sound and audio-visual system. Rates have been created for churches, non-profit groups and businesses. Alcohol will not be permitted. To contact Bryce for more information about reserving the center or to make a reservation, call 501.733.4263 or email Marketing@RenewalRanch.Net. Bryce points out that money generated by outside events at the Ranch will go back into the ministry, providing resources to help more men battling addiction.